Dimensions 0.50 by 6 by 8.75 in. Amazon.com description: Product Description: In this book Svi Shapiro explores the ideological and attitudinal functions of schools, looking especially at what is called the 'hidden curriculum.' He offers both an analysis of the role of education in producing and maintaining attitudes and values that contribute to our competitive, socially unequal, instrumental, consumerist, and self-oriented culture and a radically different vision for what our schools should be about--a vision that focuses on education's role in supporting a more critically reflective, socially responsible, and compassionate culture. Federal and state legislation have propelled schools today in the direction of an increasingly test-driven, instrumental, and individually competitive regime. Under these legislative mandates, schools are increasingly alienating and stressful places for both students and teachers. Most disturbing is that this form of education is not conducive to providing young people with the capacity to cope with the moral, cultural, spiritual, and political challenges of the world they inhabit. More than only offering a critique of schools, Shapiro proposes a counter-vision that can lead to a different kind of culture and society, and he discusses strategies for advocating and implementing it. 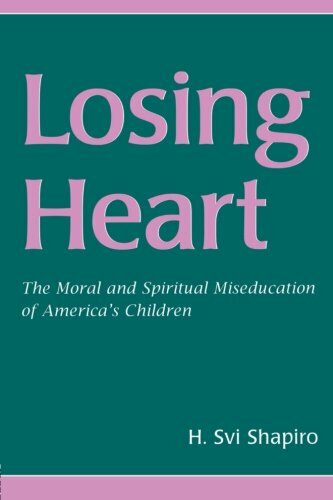 Written in a style that is very accessible to a wide range of readers, Losing Heart: The Moral and Spiritual Miseducation of America's Children is also carefully researched and draws on relevant theory to make a strong case. This book speaks to a wide range of readers, including academics and students in education, sociology, anthropology, political science, and cultural studies; public school professionals; and the general public interested in education. It will appeal to faculty in schools of education who are looking for a text that offers both a critical language and one that speaks to possibility and change. About: In this book Svi Shapiro explores the ideological and attitudinal functions of schools, looking especially at what is called the 'hidden curriculum.